As home to the Volunteer Center of Washington County, The Hub strengthens our community and guides social change. A local gathering space that fuels our neighbors with purpose, The Hub distributes all of our proceeds to more than 50 local nonprofits, helping provide the manpower and resources to continue their missions. Each drink and food item on our menu are sourced locally, including our fair trade coffee, roasted by Stone Creek Coffee in Milwaukee. 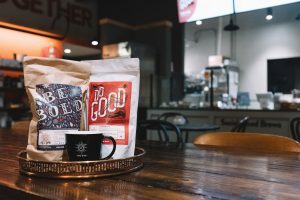 Whether you purchase a coffee or add your pocket change to our tip jar, your support helps empower our community with social good, one cup at a time. Contact us to learn more about how you can make a greater impact in our community. 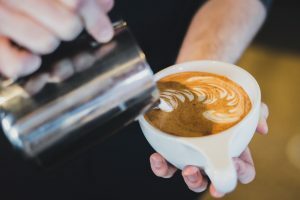 Since our doors opened in February 2018, $33,306.05 has been donated to local nonprofits & our volunteer baristas have logged 10,238 volunteer hours. Love what you hear at The Hub… now you can listen in anywhere! SOUP | Each day we offer 2 soups, some days featuring a local favorite, the Wisconsin Soup Company. 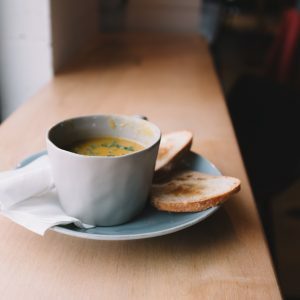 Soups are served by the bowl or cup with a side of bread. QUICHE | You’ll find a new selection of quiche everyday. 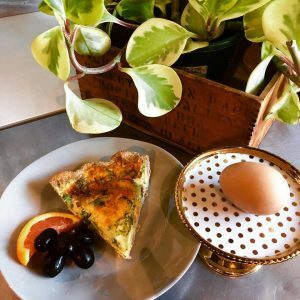 Our quiche is made fresh with local farm raised eggs, and organic Grafton Stone Mill flour by our amazing volunteer bakers. 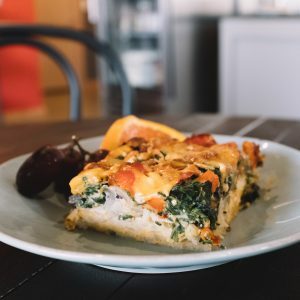 EGG BAKE | Wake up to our delicious vegetarian and gluten friendly option, served with fruit to round out your meal. 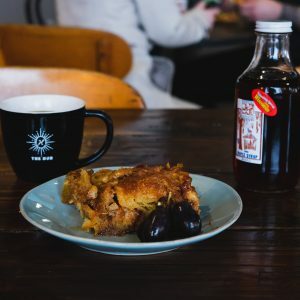 FRENCH TOAST BAKE | We’re talking buttery croissant layers with notes of vanilla & citrus, drizzled with Riveredge Nature Center maple syrup, served with fruit & made by our volunteer baking crew. BAKERY | Each day we fill our case with a tempting selection of Stone Creek Bakery like croissants, danish, and muffins. 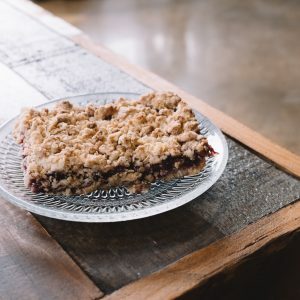 In addition, you’ll find gluten friendly oat bars, cookies, and other tasty treats made by our volunteer bakers. Our signature drinks are made with fresh Sassy Cow milk from Engelhardt Dairy. 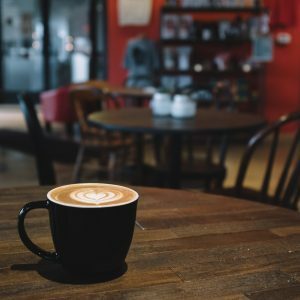 Not a coffee drinker? We also serve a wide array of beverages including smoothies, fresh juices, kombucha and a variety of Rishi Teas. Sweeten your tea with honey from Thill’s Honey Garden. Specialty drinks can be served hot or iced.